Today, we’ll discuss about how to combine the powers of Riminder, the 1st AI powered Infrastructure for your talent pools that helps centralize, score and control your talent pools, and Trello to kick off automation for your hiring process. Trello is a project management and collaboration tool that organizes your projects into boards. With Trello, you can track the progress of a project as the tasks move to different stages. It can help you structure almost every process in your organisation, ranging from complex IT projects to your personal roadmaps. An increasing number of startups around the world and especially in Silicon Valley have been using it as a free ATS (Application Tracking System). As a recruiter, it can help you set up your recruiting pipeline with columns that correspond to the different stages of your hiring process. Our Trello integration helps recruiters to kick off automation within their applicants’ workflow. It allows them to set up an efficient data pipeline that automatically feeds their Trello board with shortlists of candidates and relevant information to drive their interviews. Therefore, they can spend more time on tasks that are more emotionally intelligent, leaving behind them the less valuable and time-consuming tasks. 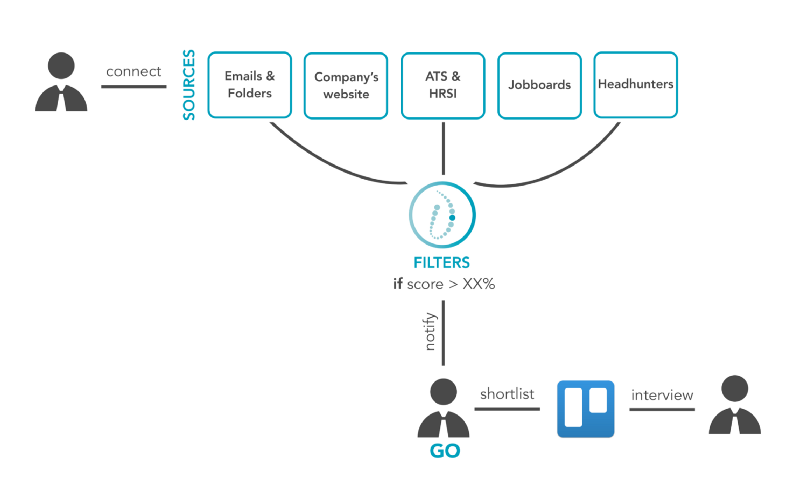 Riminder collects profiles (all resumes formats, all types of jobs) across all sources of candidates, whether they come from emails, folders, ATS, or any other internal and external sourcing channels recruiters may use. The recruiter can set AI-powered filters associated to different positions to score candidates and rank them by relevance. The recruiter can review candidates by giving them a “YES”, “NO” or “LATER” label or set automatic rules to send the most relevant ones to relevant workflows or third party apps. A Trello card is automatically created for every candidate that got a “YES” action (positive review) from the recruiter. The same information can be sent to any ATS used by recruiters. Once the card is added to Trello, they can easily keep up with their hiring workflow. Adding comments or notes about the candidate, assigning and tagging other teammates, attaching files or documents … help to keep everyone organized and access the relevant details in one place. As the candidate moves forward in the interview process, they’ll also be able to move the card to the next list. How to leverage Riminder+Trello to drive your interviews? On average, less than 20% of candidates interviewed actually get a job offer (at least in startups and SMEs). Low conversion rates can be symptomatic of a lack of clear guidelines for skills check; especially for the 1st interviews, often more focused on the cultural fit. 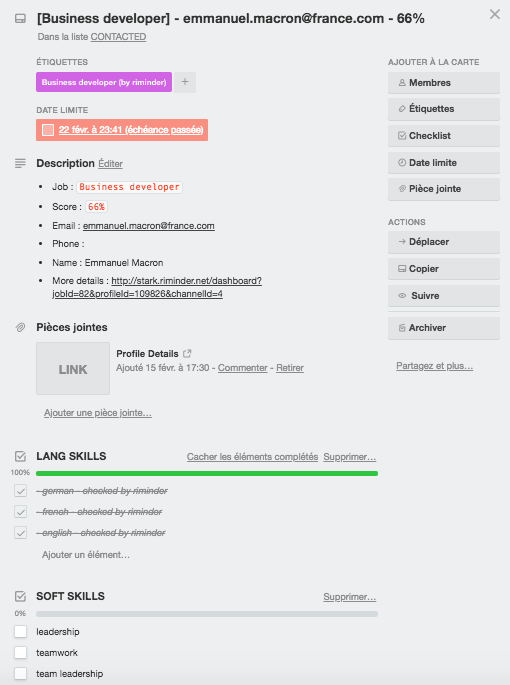 With Riminder+Trello, recruiters are better prepared, as they can see at a glance what skills to focus on - hard skills, soft skills and languages being automatically generated as checklists on the Trello card based on our market analysis for the job. There are less back and forth between recruiters and managers, and the former are better equipped to challenge the latter. Not only can Riminder+Trello help raise conversion rates, but it can also increase the overall performance of the HR team. How to set up the Riminder+Trello Integration? The Trello integration is really simple and only takes a few minutes directly from your Riminder platform. If you don’t have one yet, get started now! And here is how to integrate your Riminder platform with Trello. Riminder+Trello helps you keep your workflow transparent and your recruitment pipeline up-to-date. All in all, you are able to build and automate a clear and easy-to-follow workflow suiting your needs and boosting your productivity.